Veteran wrestler Tonya “Triple Threat” Evinger made a successful flyweight debut on Saturday evening at Fight Hard MMA in St. Charles, Missouri. Evinger scored a Split Decision victory over long-time Brazilian standout Carina “Beauty But The Beast” Damm in the night’s main event. Also on the Fight Hard MMA card, Tamikka “Boom Boom” Brents made her long-awaited pro debut and stopped Jessica “Raising Havoc” Halverson. In other action on Saturday night, Sadae “Manhoef” Suzumura submitted teen prospect Shino VanHoose at Pancrase Progress Tour 12 in Tokyo, Japan. In a bout that many had felt would end quickly, Evinger (11-6-0) and Damm (17-8-0) instead battled back and forth for 15 minutes. As she often does, Damm had her best success early in the fight, but Evinger maintained her composure and began to take control of the bout in the later rounds. She held an edge in the striking exchanges and did enough in rounds two and three to take a Split Decision victory. Judge Jackson Harper scored the close fight 29-28 for Damm, while judges Barbara Madison and Rob Francis had it 29-28 for Evinger, who has won three straight. With the victory over the former top-three ranked Damm, Evinger has kicked off her flyweight campaign in impressive fashion. She has expressed an interest in signing on with Bellator in pursuit of a spot in the promotion’s rumoured 125-pound women’s tournament next year. Damm, who was originally set to rematch Kalindra Carvalho Faria in three days in Brazil, has now tasted defeat in five of her past seven fights. She will no longer face Faria in Brazil and has been replaced on that card. Brents (1-0-0 pro; 12-0-1, 1 ND overall) was originally scheduled to make her pro debut against Olympic medallist Randi Miller in September, but that bout was scrapped when Miller failed to show up at the pre-fight weigh-ins. On Saturday night, Brents was at last able to compete as a pro for the first time and she made the most of the opportunity. From the outset, Brents rocked Halverson (3-2-0) with punches on the feet. She took the fight to the mat and continued to punish Halverson with strikes on the ground. Following a final barrage of punches and elbows, the referee intervened to stop the fight at 4:01 of round one and Brents walked away with a dominant win. She has yet to taste defeat in 14 career bouts and has gradually moved down in weight in hopes of competing in higher-profile featherweight fights next year. In her second appearance for Pancrase, Suzumura (4-1-1) notched her third straight victory by defeating 17-year-old VanHoose (3-2-0) with a second-round kneebar. Suzumura was too strong for her younger opponent and stuffed VanHoose’s takedown attempts. When the fight did hit the mat, Suzumura took advantage by locking on the kneebar and VanHoose was forced to submit at 2:18 of the second round. Suzumura has secured finishes in three of her four wins and is quickly making a name for herself in the atomweight division in Japan. 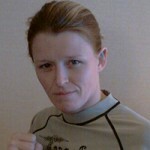 tamikka boom boom brents won fight of the night prolly one of the best female fighters ive ever watched!!!! !